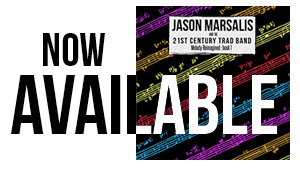 The shift from drums to vibraphone began quietly for Jason Marsalis, about 15 years ago. By now, it’s complete; “The 21st Century Trad Band” (Basin Street Records) is the second album fully to feature his Vibes Quartet, an agile, swinging unit with the pianist Austin Johnson, the bassist Will Goble and the drummer Dave Potter. The title indicates Mr. Marsalis’s cheeky self-awareness as a New Orleans jazz scion, but it also reflects the genuine in-betweenness of this music, as much on a buoyant funk tune like “Ratio Man” as a clackety saunter like “The Man With Two Left Feet.” There’s a spine of traditionalism here, to be sure, but Mr. Marsalis, leading with flair, keeps its gaze pointed forward. This entry was posted in Articles, Press and tagged Austin Johnson, Dave Potter, Jason Marsalis, jazz scion, Nate Chinen, New York Times, NY Times, Ratio Man, The 21st Century Trad Band, The Man With Two Left Feet, Will Goble on October 24, 2014 by abell.